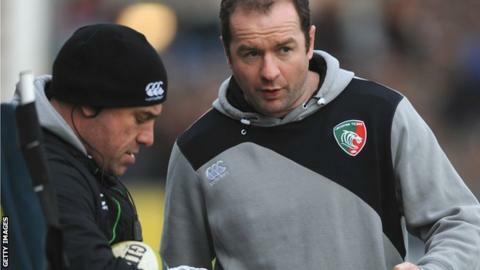 Backs coach Geordan Murphy says he is close to signing a new contract with Leicester Tigers. Murphy, 36, spent 16 seasons as a player at the Welford Road club before joining the coaching staff after his retirement in 2013. The former Ireland full-back told BBC Radio Leicester: "I am in the process of sorting out a contract. "I want to stay and Leicester want me to stay. We haven't signed anything yet but are on the path to sorting it out." Murphy stepped up from his role as assistant to backs coach following the departure of Paul Burke earlier this season. And he said he was "excited" by the prospect of working with new head coach Aaron Mauger in the restructured coaching team next season. Murphy said: "I have spoke to Aaron quite a bit and he is keen for me to be involved in a similar role that I have been doing this season. "He brings in a wealth of experience from Canterbury in New Zealand which is one of the best teams in the world, has some very good ideas." Murphy described his two seasons as a coach as a bit of a "rollercoaster ride". "It's been a pretty steep learning curve," he added. "Paul was very good to me and helped me out and has been missed. "The workload has increased considerably, but it's an opportunity for me to develop. I am very young in my coaching career. "I have loved it, and hopefully I will keep learning and getting better and, at some stage, I might be good enough. "I have said I would like to stay here for as long as I possibly can, I feel very passionate about the place and players. "I won't be able to stay forever unfortunately. At some stage I will have to move on if I am not booted out first but as I love it here and really want to stay."